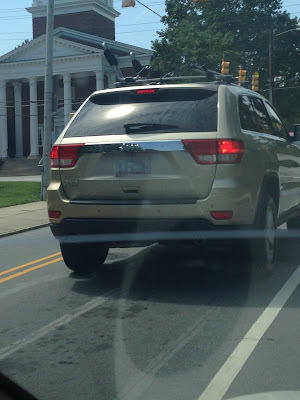 I've written before about my thoughts on racks, you can read them here, but the gist of it is that I don't think J type cradles work well on tall vehicles like SUV's. I think they work better on low cars like mine. So this is a nice Jeep with a pair of J cradles, unfortunately the low side of the cradle, where you would load the boat is facing the inside of the vehicle, meaning it is almost impossible to use this mount correctly. I suppose you could slide the boat forward from the back, but the pads are going to fight you the entire way. Maybe this person just mounted them, and hasn't used them yet, and haven't realized they are supposed to go on the vehicle facing the other direction? Let's hope. But then what is this persons excuse? They must have realized that something was wrong? If you can't tell, the cradles on the right are mounted correctly, but the cradles on the left are facing the wrong direction. Waiting in customs coming back from Canada when I did the Inside Passage, I saw a van in front of me with the low side of cradles both mounted on the inside, and there were boats in them! They must have realized something was wrong. Is there some alternate use for J cradles I am unaware of? If so, please let me know. The worst offender of rack madness is this poor fellow. Okay, there is a lot going on here. First, I should point out, that while it is hard to tell in this photo, the front cradle is actually not contacting the hull of the boat. The 60 mph wind is pulling the nose of the kayak to the left, and there is nothing holding the nose in place, because the front strap is too lose and not properly securing the boat, and there is no bow line. Oddly though, there is a stern line - I think this is so that when the kayak finally breaks free it will tow behind the truck! It is hard for me to tell exactly how he has the straps securing the boat, but they aren't doing a very good job, and there is an inexplicable third strap in the middle of the kayak, that as far as I can tell is just going around the boat. Hey, at least the cradles are facing the correct direction! The advantage of a J cradle is that it maximizes bar space. But this gentleman doesn't have anything else - currently - set up on his roof. They are also one of the less expensive options, but judging by the aero bars, and the somewhere in the neighborhood of a 60K truck, I don't think cost was an issue. The boat is also an expensive thermoformed recreational kayak. 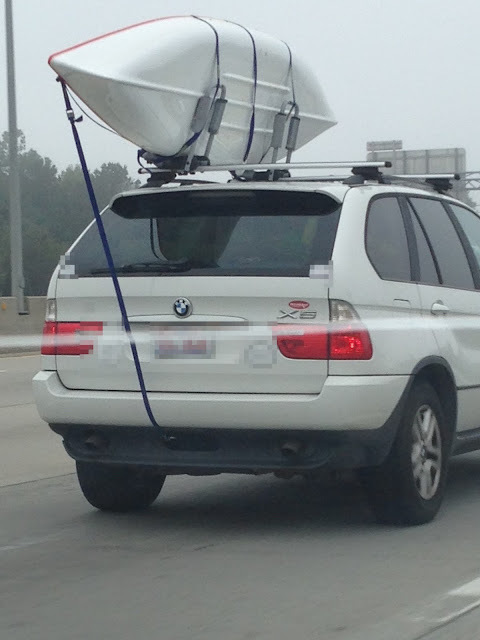 I tried to get this drivers attention, I would have gladly helped him re-strap this boat, but alas, HE WAS ON HIS PHONE! I gave up and continued my drive. 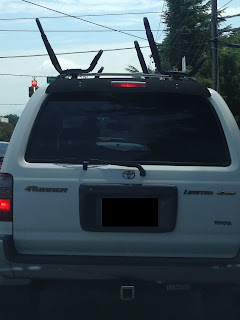 Most of this I think is pretty humorous, but I highly recommend that if you buy a roof rack for your boat, and don't know how to use it, or what straps to use, please seek out help. You can even email me here, and I will be glad to help you out. J style cradles work well on cars, but if you are going to use them on an SUV be careful you don't fall while loading the boat. Always put the straps on the cradle first, then load the boat. Loop the straps through the top of the cradle so you have both ends in your hand. Walk the back one to the rear of your vehicle (so it is over the trunk or the hatchback), and the front one to the front of your vehicle (so it is over your cars hood). Put your kayak in the cradle, and now you can slip the doubled straps over your boat. Make sure they aren't twisted, and can be pulled easily in both directions with the top of the cradle as the "pulley". Pull the non-buckle end, so the buckle is hanging down, about halfway down (across) your kayak. Pass the non-buckle end behind your rack tower, and then back up to the buckle. Now pass the non buckle end through the buckle, and pull it down to make it tight. (This way is much easier so you don't have to pull it up to tighten it.) Repeat for the second cradle. If I am not getting on a highway, I don't use bow and stern lines. If I am I use both. If you are going to use only one, use a bow line, as that is where most pressure is coming from. There are many ways to rack your boat, this is the way I do it. Not necessarily the best, but it works well for me.